Check out this 2018 update of using Skype in the classroom, complete with a PDF full of tips to ensure your Skype call goes smoothly! Increasingly, educators globally are transforming their classroom using Skype to create powerful, authentic, motivating learning experiences for their students. From connecting with classrooms in other locations to learning about each others’ culture to connecting with content experts — educators are extending learning beyond classroom walls. 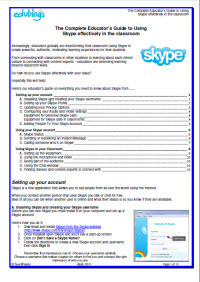 Alternatively, here’s The Complete Educator’s Guide to Using Skype effectively in the classroom PDF version — for you to download and print off. Skype is a free application that allows you to call people from all over the world using the Internet. When you contact another person that uses Skype you talk or chat for free. Best of all you can tell when another user is online and what their status is so you know if they are available. Before you can use Skype you must install it on your computer and set up a Skype account. 3. Click on Don’t have a Skype Name? 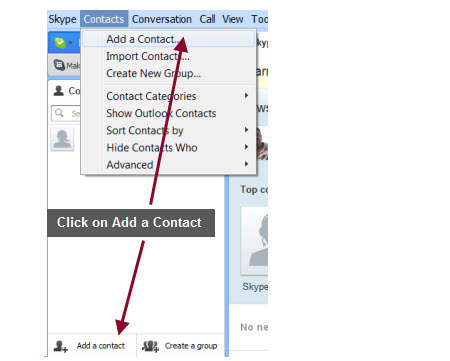 Before adding contacts to your Skype account it is important to set up your Profile. The more relevant the information you include in your Profile the easier it will be for others to ensure they’re connecting with the right person. It’s harder to located the correct contact without a profile picture and you’re less likely to added as contact if you’re using the default avatar. 3. Add your Country/Region, State/Province, City, Time, website (if applicable), gender and language by clicking on each field or using the drop down menu. 4. Complete your About Me information. 5. You can check how others will see your profile information by clicking on the Public profile and Contacts only buttons at the top of your Profile page. 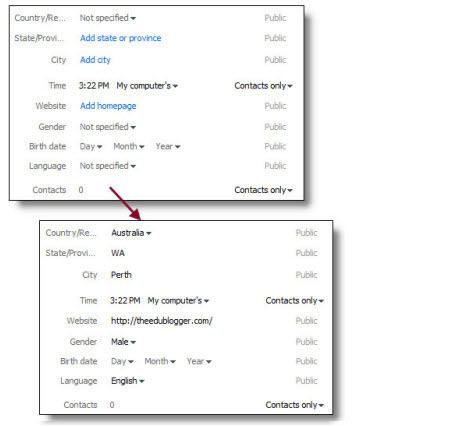 Public Profile is what people see when they search for your Skype contact details. Contacts Only are what people who have been added to your Skype account can see. Your privacy settings control who can contact you via Skype, how long your IM history is kept and is used to manage blocked users. It’s worth adjusting these before getting started using Skype. While anyone on Skype who searches for you can add you as a contact or call you. To change your privacy settings select Skype > Privacy in the menu bar. What privacy options you choose is entirely up to you! 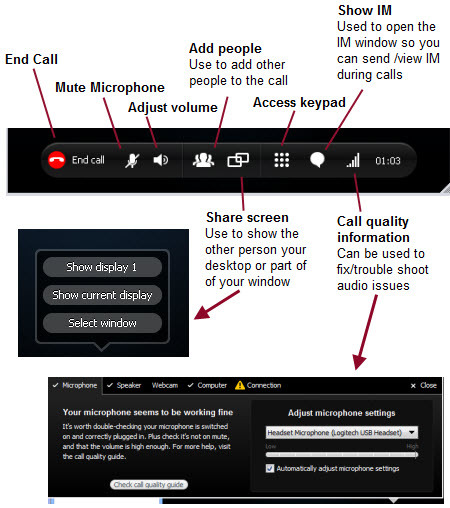 It’s best to make sure your audio and video is set up properly before using Skype to make calls. There’s nothing more annoying frustrating than the other person not being able to hear your voice and/or you not being able to hear theirs. 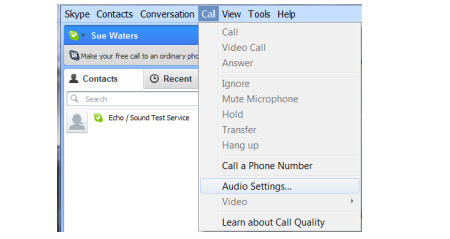 Once your Skype equipment is connected to your computer all you need to do is configure your Audio settings by going to Call > Audio Settings in the menu bar. Now just select your Microphone and Speakers from the drop down options. Repeat the same process to set up your web cam using the Video Settings options. 4. Alternatively, you can click Check Settings to the right of Call. To contact people you will need to add their username to your Skype account. 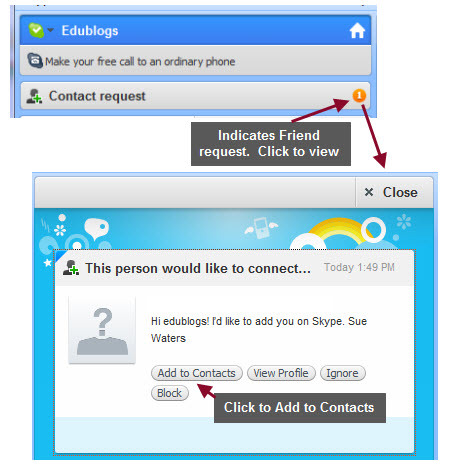 However, you can easily search for friends’ Skype account using their email address or name. 1. Select Contacts > Add a Contact in the menu bar or click on Add Contact. 2. Enter their full name, email address or Skype name. 3. If the Skype account of the person you wish to add is displayed, click Add below the contact. If more than one Skype account matches your search, click on view to check out all matches found. 4. Before the contact can be added, you must send a contact request to that person. Enter some text to introduce yourself and click Send request. 5. The contact will be added to your contact list, but will appear offline until they accept your request. 6. Once the person agrees to your request, they will be added to your Contact list. You can then make free calls and video calls to that person, and send instant messages and files to each other. Best part of Skype is you can tell when another user is online and what their status is so you know if they are available. Some one’s Skype status is showing Available or Away from keyboard are normally near their computer. However, it good etiquette to send a person a short Instant message and waiting to see if they reply rather than calling them as it might not be convenient, you might be interrupting their work flow or they may not have their audio configured. Once you’ve engaged in a IM conversation then you can nicely ask them if they mind or if it is convenient to use voice. 1. Find the person or group you want to message from your contact list. 2. Their username will load in the main window and you just click inside the conversation box. 3. Now type your short message and click the blue Send message button, or press Enter on your keyboard. If someone IMs you, your Recent tab will turn orange and will show a number to to indicate how many new IM you have received. You’ll also see an orange dot against the person’s name in your contact list who has sent the IM. 1. Click the Recent tab. You’ll see a list of contacts who have recently contacted you using IM. 2. Unread messages are indicated by the person’s name shown in bold with a number next to their name. 3. Click on the person’s name to open up the main window and view the conversation. 4. Type your reply inside the conversation box and click the blue Send message button, or just press Enter on your keyboard. 4. Use Extra features like play games and personalise your Skype. Read more about Extras here. Remember it good etiquette to send a person a short Instant message and waiting to see if they reply before calling them as it might not be convenient, you might be interrupting their work flow or they may not have their audio configured. 1. Find the person you want to call by looking in your contact list. 2. Check their Skype status and if they are available click their name. You will see their details in the main window. 3. Click the green Call button . You should hear ringing. If you don’t hear the other person or they can’t hear you, click the call quality icon in the call bar . 4. Hovering your mouse over the main window during a call brings up the Skype menu items which you use to access different Skype features. 5. To hang up, click the End call button. Using Skype with your students does require new skill sets to developed. Where they place objects to display to the other class. It’s also worth keeping parents and families informed of why and how you’re using Skype in the classroom so they feel comfortable with the process. Check out Keith Ferrell’s Rationale for using Skype in the classroom and parent permission slip — which he uses to explain the process to his families. If using a webcam where the videoconference is projected onto an interactive white board for display or via a data projector locate the webcam beside the board, so the speaker can see both the webcam and class they are speaking to. Have a chair near the microphone for speakers to sit on. Have the webcam on eye-level with the speaker so they don’t have to look up or down at the webcam as this will distort the view of the class watching. Set up the desks for students not at the microphone, so they can still be seen by the class you are speaking to. Ensure everything is set up from the start including any objects you want to share. Do a test Skype call with the other teacher before the day so you can both trouble shoot any video and sound issues. Test the equipment before starting class. If you experience issues with the call during the session try switching off the video to see if that helps. Have a management plan for discipline problems before commencing — so you can intervene quickly if needed. Speak clearly and try to slow down your normal speech. It takes time to adjust to some accents — talking slower helps. Speak fluently with no small talk or swearing. Avoid language that is only from your country unless you explain the meaning to your viewers. When it is your turn to talk, make sure you know what you are going to talk about. Try to explain rather than give a one or two word answer. Show confidence when speaking – this might mean a few rehearsals for some students. Left mouse click on the corner of the main window and drag to increase the window size to enlarge the video and then click on the Show IM icon so you can send IM and watch the video. If not using IM, then just click on Full screen to enlarge the video stream. Be quiet when someone is speaking on the microphone. Listen attentively when you are not the speaker, as you might know the answer to the question being asked by the other class. Don’t sit friends near each other as they will tend to distract each other when not the speaker. Sit where you can see and hear the conversation but where it is also easy to get up and go to the microphone. IM is excellent for feedback and questions. It’s especially ideal when connecting with classes that English isn’t their first language, or when sound quality isn’t good — it’s a great way of typing in key phrases to ensure information is being understood. Use IM to send a quick message to check the other class is ready before calling. Allocate students to be in charge of the IM conversation during the video conference and provide them clear guidelines of their role. Would love to hear about your experiences! What advice have we missed? What other advice would you give educators using Skype in their classrooms? And we’d love to hear what you’ve gained from using Skype in the classroom — please leave a comment to let us know. this is very detailed tutorial on skype but its interesting to read whole and interestingly i am in need to setup a new account for video conferencing need. I will prefer skype as per your views. 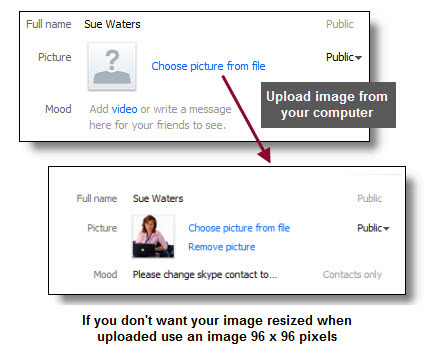 Sue – I’ve been a Skype fan for years, but for classroom instruction, I’d think something like RHUB would be preferable. It has more online collaboration options. I likе the vаluable infο you proviԁе іn your аrticles. I will boοkmаrk yοur blοg аnd chеck again heгe regulаrly. I аm quite sure I’ll learn many new stuff right here! Good luck for the next! I make use of the smaller USB one, Can somebody tell me the one I want, Assist! , That one Should I hute to play MP3? Tremendous things here. I’m very glad to look your post. Thank you a lot and I am having a look forward to touch you. Will you please drop me a e-mail? Pingback: The Complete Educator’s Guide to Using Skype effectively in the classroom | The Edublogger | Tommy found a real book. Thanks for such a very informative article about using Skype in the classroom !! I have used Skype with my students to interview native professionals, giving my students the chance to speak to a native and know alot about other cultures, esp if we are studying about these countries. Every time I use Skype in such international interviews, I gain more experience. My students’ last interview with Graham Stanley was a great success. We have taken photos, recorded the interview using MP3 Skype recorder, which was of great use for my students who were able to re-listen to the interview and get all the information they missed during the live interview. I have also created a phtotpeach video presentation using the photos of the interview. They got lovely comments from teachers and friends all around the world, which was very motivating and rewarding for them !! I used to ask my students for their instant feedback directly after the interview to get their real feelings of how was the experience to them. Analysing their feedback, I could see how students could get the educational, cultural, … aims of these interviews. i want to have my full skype address but i dont know where to find it,can u help me? Thank you so much for creating this page! It has really helped me a lot of information! Thank you for all of the effort you put in to making this blog an awesome and helpful one! Thanks!!! I showed them my viison for the year, which I created over the summer and then I showed them the viison video the kids came up with last year. Then they broke into teams and just spoke to each other. We then then shared our ideas, picked our wording, and wrote it into the Animoto – I have the free educator account. After that the kids looked through the pictures, picked the ones they liked, picked the music etc and then finished it. My classroom was pretty chill while we did this, the kids were talking and hanging out wherever they wanted to as long as they could see the screen. It was very relaxed and together. I hope this helps. how can I share my shoutout to my friends? What are the messages (or names) that are grayed out under my contacts? Some have them, some don’t. Hi Tracy, if they are gray out it means they haven’t added you as a contact to their Skype account. Wow – this was a great guide on using SKYPE. Thank you. I have used Skype to do contests between classes that I have in multiple buildings. I have also had students who Skyped with relatives who were soldiers in Iran who used those interviews as part of their class presentation. Some authors have done school “visits” using Skype. A teacher from another school district and I Skyped so that our classes could see what projects the other students were doing in their tech class. Since I am part of the baby boomer generation, at times I hesitate to use some technology until I know what I am doing. For students in my high school classrooms (and younger), they show no hesitation and charge right in. I have a 10 year old cousin in Australia that feels completely at home on Skype and sometimes has to coach me to remember to click on the video button when we talk! Do you find that the young people today avoid “reading directions” and jump right in? As always, a great, thorough, pertinent post. Thank you! We’ve recently begun Skyping in my school and have had some amazing experiences. We’re set up a “Skype-in Friday” where for 30 minutes each Friday morning, parents and grandparents can Skype-in and chat with their child/grandchild to get a summary of the week’s learning. I just tried to leave you a nice comment about your article but it kicked it back as duplicate, which it’s not. Very strange. Well if this one goes through thanks for the article. It was very informative. Wow what a wealth of information on setting up skype. Came in handy when my 10 year old son wanted me to setup skype for him. Just one more thing I have to monitor now. Thanks for the info though. 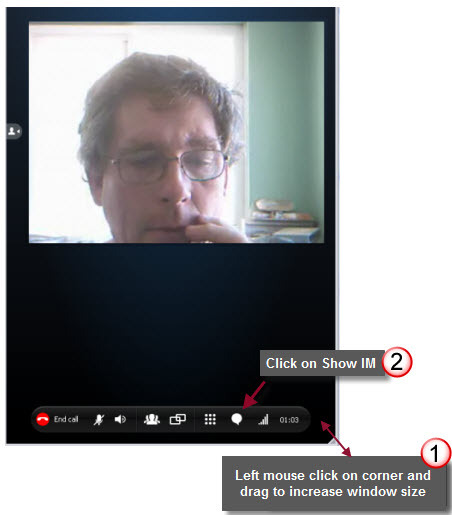 An excellent article for those new to using Skype for teaching. I own an online Spanish school and have been tutoring using Skype for over 4 years. The quality of connections has improved dramatically and I am finding most new students already have Skype, so it is much more natural for them to use. Hi, this is really helpful, thanks. I held a coaching session with a student the other day via Skype and her Skype kept disconnecting. This leaves me feeling nervous about using it for larger scale teaching. What can I do to ensure students have access that is consistent? Hi Illysa, you can find variations with connections on Skype which is why it is important to pretest your connections the day before. However, most people will be aware if they experience connections issues so you can plan around this. I do believe that the gains are definitely worth it. You really do empower your students when they learn how to use these types of tools. My husband isn’t the greatest with technology and it is pleasing to see my kids taking over and being able to quickly connect on Skype wherever they are and contact me when I’m travelling. I’ve used it to communicate with students who have had multiple absences due to illness in order help them stay current with the class and let them know how much they are missed. Our class has also chatted with classes in other locations to talk about science projects, math investigations, performed plays and songs and challenged each other to various “quests”. We’re hoping to get to stay in touch with some friends that have recently moved by Skyping with their new classes and broadening our peer/ colleague base. I’m planning next year to use it to communicate with parents when they can’t come in for a conference due to travel, etc. At the beginning of the year I’ll ask parents to share their Skype names with me so I can put those in the system. It will come in handy during the year for impromptu career day class talks but instead of waiting until career day we can schedule it point of need as we are studying certain related content. You’re welcome to share any ideas. Hi Keith, the trouble is as you highlighted in your post is traditional media constantly warns of the dangers while failing to showcase the great things it has done. Hi Carla, glad you’re found my post useful. Always happy for others to refer to it and link. It’s only when someone copy/pastes a large amount of the text and images I’ve written that I get annoyed. Thanks Buxxiebeeteacher for sharing, hadn’t thought about using it for role playing. What a great idea and all students benefit from gaining the skills! Just a quick suggestion for how to use Skype in the classroom. This was used to support our autistic classroom. I set up two stations with skype. Both were isolated from one another so sound was not bleeding through the rooms. Next, I gave the students in my regular classroom one scenario and the autistic support students another. They went to the stations and role played the scene. For example: call the doctor and make an appointment. Regular students were the receptionists and the autistic support students were the callers. This was a great experience for all in using the phone effectively. Thanks for compiling such a thorough guide to Skype in the classroom. I’ve used it a bit at home, but hadn’t really given much thought to how I could use it in the classroom before. This is really awesome! It’s also inspiring to read that other teachers are trialling this in their classrooms and sharing the results. Would you mind if I referred to this guide on my website with a link? Hi Keith, thanks for bringing the concerns of the parents and family to my attention. I hadn’t considered that aspect with parents. I’ve left a more detailed comment on your post but hope it is okay? But plan to update my post to highlight informing parents then I’ll recommend they check out your post and permission letter. Thanks Sue. I hadn’t expected such a concern either, but a little education goes a long way. Great guide! I would add to join Skype in the Classroom, a forum for educators to connect with each other and with projects. I think a lot of teachers don’t know anyone else on Skype so they don’t see the purpose. Thanks Chelsy for your nice feedback. 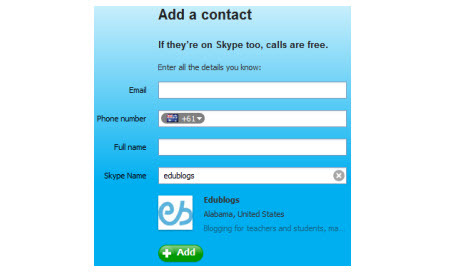 Skype in the Classroom website is included in the post but it is perhaps hidden amongst all the information under classroom. I’ll look at editing the post later to see if I can add some graphics to make it stand out more. As a high school English teacher in Ontario, Canada I am always looking for valid oral language opportunities for my students. I have used Skype to connect with professionals in different parts of north America. These speakers are usually everyday people doing what my students are interested in doing for a career. (Bakery owner, Truck Driver, Artist, Inspirational Speaker) My students do a little research about the person we are preparing to interact with and then they make predictions and generate questions for this person in small groups. We usually give the speaker 10 minutes to speak to the group and then we open it up for questions from the class. Students must actively listen to the answers so that their questions and comments are not duplicated. It is an excellent tool for getting in speakers for little to no money. As a culminating, students will respond to the speaker on a blog or through email. Depending on the intention of the lesson, we may do a shared writing mini-lesson to respond as a class. I always want my students to learn from the people around them and to apply this learning to their lives. This has been very powerful for students and it is simple to use. I used Skype with a class of 25 to one speaker. I have also connected classrooms together. We have ground rules that ensure that all students are actively listening and being respectful to one another during the discussions between classrooms. I have always been concerned about the connection quality and have found great success bypassing the school connection by tethering my iphone to my laptop for a clear connection. The microphone and camera on my apple is great for the situation. I just make sure we do not Skype for longer than 15 minutes. This limits the GB’s I use on my cell phone plan. Always have a back up plan…respond through the chat feature of the Skype, send emails with question and answer sessions. Also, if Skype isn’t working well, another option is sometimes gmail. If both people speaking have an account then the video chat can happen this way too. I am happy to share a year later that Skype has been a great experience for my girls talking to grandma.